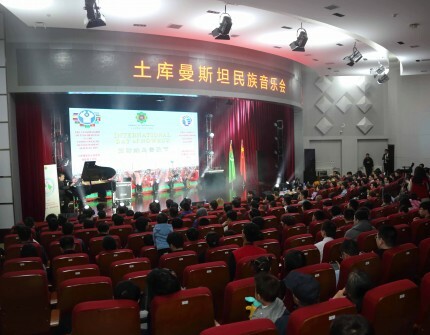 On March 18, 2019, the Embassy of Turkmenistan in the People's Republic of China held in China Petroleum University in Beijing, together with the university’s rector’s office, a presentation and a festive concert, as well as a reception and treat service in honor of the first Caspian Economic Forum, the chairmanship of Turkmenistan in the CIS and IFAS as well as the International Day of Novruz. At the grand opening of the presentation, the Ambassador of Turkmenistan to China made a speech, where he spoke in detail about the initiatives of the President of Turkmenistan, the foreign policy plans of our country to actively participate in international affairs. In particular, he presented the first Caspian Economic Forum, which will be held in August this year in Avaza National tourist zone. The Ambassador emphasized the role and initiatives of President of Turkmenistan Gurbanguly Berdimuhamedov in holding the first in the history such a Forum and spoke about its content.